Without team resilience, work pressure and stress set in. Team communications misfire, work relations become toxic, teams disintegrate. Team resilience is the unabridged version of motivation. It’s true grit at a team level. And you only get to see it when it’s needed. So here’s what team resilience is and how to build it. We understand resilience on an individual basis. After all, we learn this through experience. And we’ve all had this experience. We hit an obstacle and feel like we’ve crashed. Like there’s nothing we can do. Yet somehow, we find a way to push through and make it happen. Sounds familiar? There’s no better embodiment of resilience than Rocky Balboa. Resilience might be one of the top 3 virtues of the modern world. This notion that giving all it takes will bring forth success. Yet, some would argue that giving 110% might mean that you just don’t know math. Indeed, when we think of resilience, we try and flex an abstract muscle. Team resilience is more than an extension of individual resilience. Think about it this way. Individual resilience is in fact “true grit”. 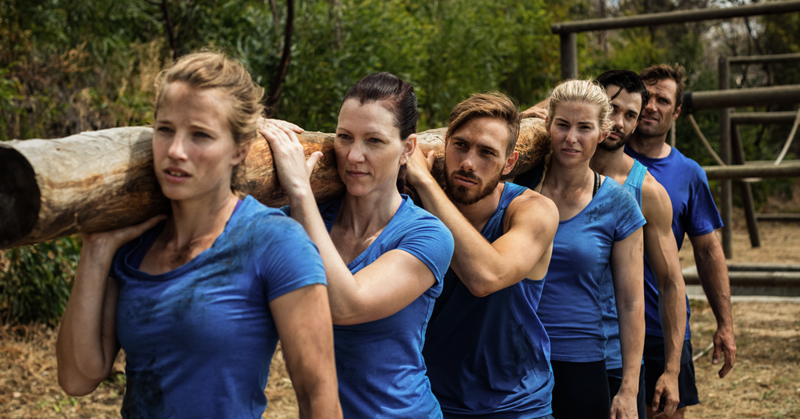 Team resilience is an organized response to an obstacle. Some might argue that it’s similar to an ecosystem dealing with a disturbance. These are valuable principles. So let’s try and use them to build team resilience. To clarify, this is not about workloads. While organizing work is important to team resilience, here we’re focusing on stressors and pressure. These are the true loads a team carries. Long after the working hours are over. The main way you redistribute loads is socializing. It might sound like it’s too little, yet socializing is highly effective in balancing stress. In fact, one great way of building team resilience is a building social support network. But having people falling back on their families and friends might be unfair. Particularly since it has to do with work stress. Sure, you can listen to a friend complain about work, in general. But wouldn’t it be great if the workplace itself deals with the stress? Indeed. This is very much related to happiness at work. Especially when building a context for meaningful relations and mutual understanding. Opening the team to conversations and mutual support. Offering constructive feedback instead of criticism. Maneuvering office communications to become active, people-oriented conversations. Instead of the typical, report-like dynamic that leaves people flustered. To open up your team, encourage them to come out with what stresses them. Have them open about what they struggle with. Let the whole team get onboard mutual struggles. Consider redirecting meetings to include precisely this solution. Turn meetings into a place where teams open up and band together against stress. Here’s a guide on ultimate meetings. Sharing the load will make everyone feel they’re part of a team. And when confronted with a challenge, your team will know how to redirect the pressure. While resilience is about conquering obstacles, it doesn’t mean you can’t regroup and be smart about conquering them. Be kind, because everyone else is fighting a hard battle. Staying on the job for too long can de-incentivize even the most motivated employee. If your workplace is all about the hours, you shouldn’t care. But if you do care about your team and it’s well-being (things such as productivity, employee satisfaction and retention, team achievements), you’ll do things differently. It’s not just sharing the load of stress. Or, for that matter, changing the load of work. Team resilience stems from teamwork. Collaboration creates accountability. Setting common goals motivates. Fighting battles with micro-goals shapes your team into an organism. You can’t have team resilience unless you have a team. A fine-tuned machine that achieves set goals. Ready to rock, ready to rumble. So if teamwork feels like second nature in your workplace, then you’re doing it right. Teamwork is the backbone of team resilience. Moreover, bear in mind that few people are mind readers. So speak your mind and let the team know what you expect. Remind everyone how their contribution makes a difference. How each of them fits neatly in accomplishing a greater goal. How they’re all cogwheels that synergize. Conversely, make sure you also cater for the individual. In fact, act as if each and every one of your team members is a worthwhile cause. Listen to what they have to say. Offer your support. Cultivating true grit is tough. Especially in a culture that appreciates flexibility and adaptability. Not calling it quits is not always in top 3 appreciated qualities for most people. But grit is a quintessential leader quality. You cannot have leadership without resilience. Because nobody can inspire, motivate and lead by giving up. Extending this mindset to the whole team might seem impossible. Yet it’s precisely what works best. Team resilience can be achieved by cultivating individual resilience. Classical models would suggest that the leader is resilient, and the team follows. A multi-core model is one with several resilient individuals that provide structure to the team. Developing a resilient mindset can be done directly, or as a collateral. Directly, it can be achieved with training and mentoring. Resilient leaders know how to nurture other resilient leaders. It is not a purely selective challenge. One in which those who fail are eliminated. It can be a learning and development opportunity. As a collateral, it steps from several other teamwork boosters. For example, using a teams decisions strategy. Hence, it provides context for leadership and resilience at a teammate level. Obstacles typically faced by management are now spread around the team. The resilient leader mindset can now manifest. Flat hierarchies provide a similar context. They cater for the “free agency” of employees. There’s a task ahead of you, and nobody else to blame. So all you can do is do your job. That’s it. To conclude, team resilience is nurtured. Sure, you can recruit resilient people. Or try to pick your battles so that you always win. But without building team resilience, you will stop at the first gate. Stumble on the first twig. Crash at the first wall. So focusing on building trust and teamwork is the way to go.